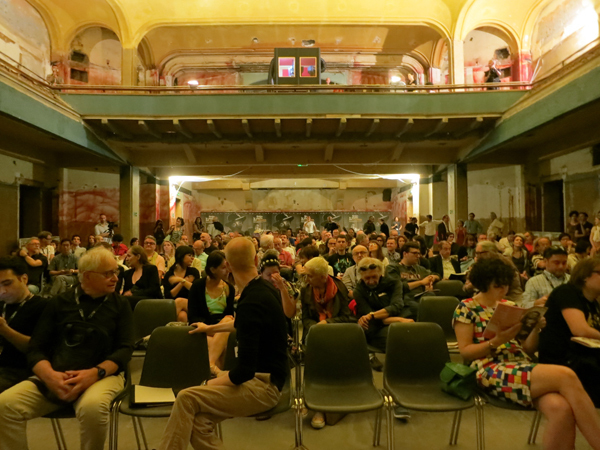 Cinema Ritrovato of Bologna got off to a roaring start on Saturday. Or rather, Friday. Or maybe the previous Monday. It’s hard to keep up; the event sprawls beyond its official boundaries. 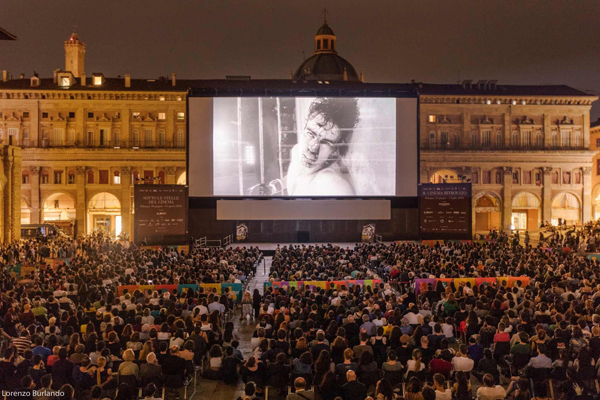 For five days before the official opening, there were one-off screenings on the vast Piazza Maggiore and in the more intimate Cineteca. 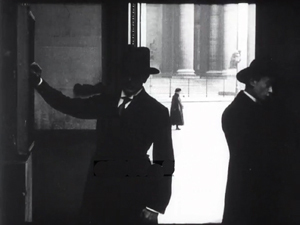 Those evenings you could have seen Gilda or Raging Bull or Madame de… or an Ingmar Bergman documentary or Sacco and Vanzetti (1971), the last in the presence of director Giuliano Montaldo. On what may be final night (who knows? ), next Sunday, the Piazza hosts a restored version of Grease. Did you know it needed restoration? Me neither. The festival’s motto might be Too much is never enough. Over 500 titles now grace seven venues, if you count the Maggiore, a little piazza featuring carbon-arc projection, and an underground warren I’ll tell you about shortly. The fact that the latter is still under construction didn’t stop the newly established programming team from, of course, showing films there. I’m here solo because household matters kept Kristin home in Madison. I’ll try to post some blog entries that suggest the sweep and depth of this festival, now more than ever the Cannes of classic cinema. 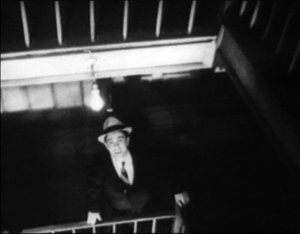 The Raging Bull screening was a tribute to a filmmaker who has always mattered to Ritrovato. One of the two auditoriums in the Cineteca is named for him, and under his auspices The Film Foundation has for years provided restored, often overlooked classics from outside the Western canon. 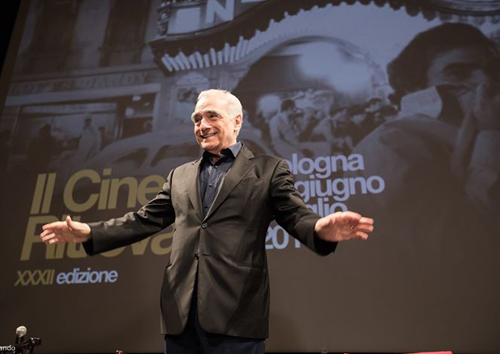 Scorsese received a hero’s welcome yesterday, with an interview in the city’s biggest venue, the Teatro Communale and a Maggiore screening of Enamorada by Emilio Fernandez. 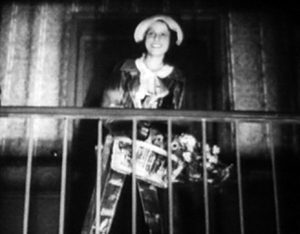 Interestingly, the Foundation has provided restorations of Enamorada in both digital and photochemical formats. I couldn’t cover either event; tickets to the conversation had long been sold out, and I was logy from jet lag well before Enamorada got going. I did, however, grab a few shots of the Piazza crowd before the screening. After twenty-plus years, I had never seen that huge space so jammed with people. An official shot of the event is at the bottom of today’s entry, and it shows only a fraction of the people assembled. A video record of Scorsese’s opening remarks is on the Cineteca Facebook page. It starts with a Mariachi band. My day before the Scorsese blowout was more sedate than usual. I caught up with several friends in these early hours so as to have time before the big crunch comes later in the week. (There are now more evening screenings than ever before.) I went to The Brat, a 1931 John Ford I’d seen before in a so-so copy. The film is minor Ford but enjoyable for its comic vignettes in a night court, a wild sequence on a swing reminiscent of Wings, and an ingratiatingly scratchy-voiced performance by Sally O’Neill. Helping the film along was the newly refitted venue, the Jolly, now cooler and more comfortable. I had time as well to re-see another 1931 title, the restored Jean Grémillon short feature Daïnah la métisse (1931). It’s a stunningly shot drama of a black couple traveling on a swanky French liner. Recut after production for reasons not altogether clear, it still retains enormous power. The gleaming cinematography sets off three areas of the ship: the lavish dining room with its big dance floor, the dark, cavernous engine room, and the misty deck where sexual teasing leads to murder. 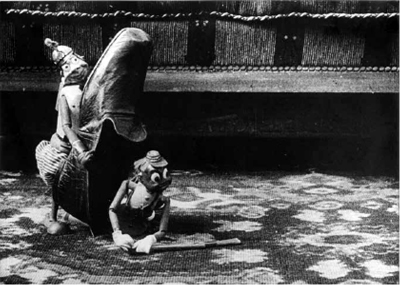 The film’s bold use of sound–a song track, pulsing engine noises, and passages of dead silence–remind us of how adventurous early talkies could be. 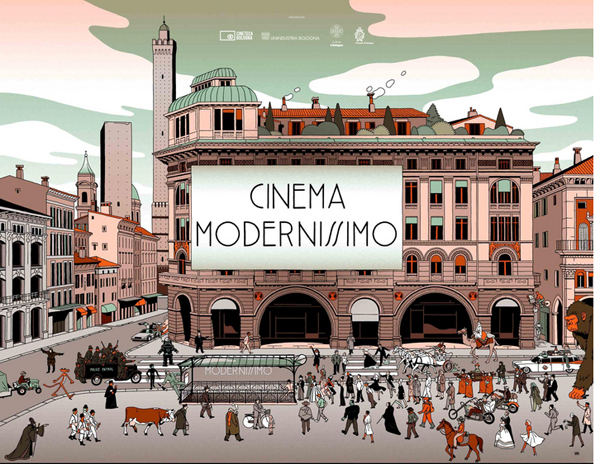 The Modernissimo cinema was built in 1915 and underwent renovation in the 1950s and 1960s. It was split into two parts, and the underground section is the one that is being renovated for contemporary use. 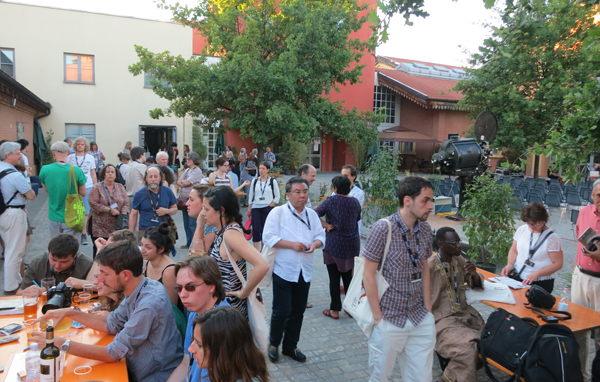 The Ritrovato team has found funding to create it as another venue for festival screenings, and on Saturday they admitted a batch of us to check on progress and see a serial. It’s a very big, raw space, with a balcony and side boxes. The seating isn’t ramped; we’re all on the same level, but the high screen compensates for sightlines. Naturally I sat in the front, so no problem there. 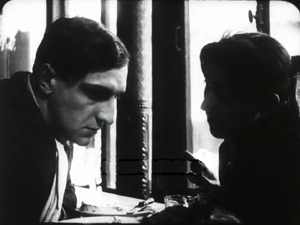 The film, the first installment of Wolves of Kultur (1918, Joseph A. Golden) was nothing to write home about artistically–plotters steal the plans for a supertorpedo–but it was fun and well preserved, with nice tinting. Marianne Lewinsky’s program notes promise that later episodes will be more enticing; she calls it a Kama Sutra of serial conventions. Some of the design plans for the cinema can be found here. Here are two of my shots from Saturday. I have more to report, but I’ll save that stuff for entries later in the week. In addition, thanks to digital whiz Erica Moulton we’ve just set up an Instagram site here. It already has shots I haven’t included in this entry. I’ll try to post pix throughout this wild and crazy event. 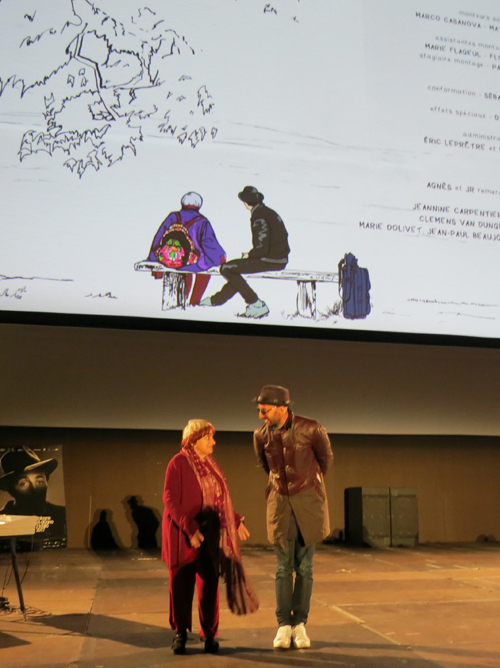 A special thanks to the Directors of this year’s Ritrovato–Cecilia Cenciarelli, Gian Luca Farinelli, Ehsan Khoshbakht, and Marianne Lewinsky–and festival Coordinator Guy Borlée, as well as to all their programmers, consultants, and staff. They pull off a magnificent, epic event every year. The Scorsese and Piazza Maggiore photos are by Lorenzo Berlando. Piazza Maggiore Saturday night for the Scorsese presentation. 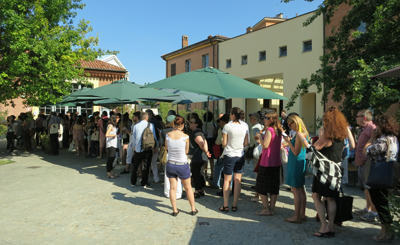 The courtyard outside the Cineteca di Bologna, during Il Cinema Ritrovato. Some initial figures are in, and they’re fairly stupendous. 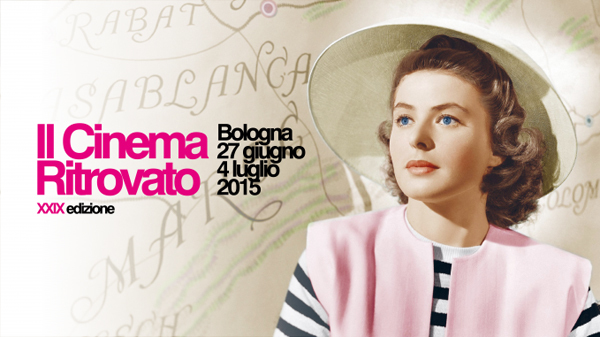 There were about 85,000 admissions to all screenings of this year’s Cinema Ritrovato, which ended ten days ago. That figure includes the big public shows on the Piazza Maggiore, but the day-in, day-out screenings were heavily attended as well. There were 2500 or so festival passes sold. Assuming that those people stayed for four of the festival’s eight days and attended four shows a day, we can surmise that at a minimum 40,000 of overall admissions came from dedicated cinephiles surging from venue to venue. And of course many passholders stayed seven or eight days and squeezed in more than four viewings on each one. 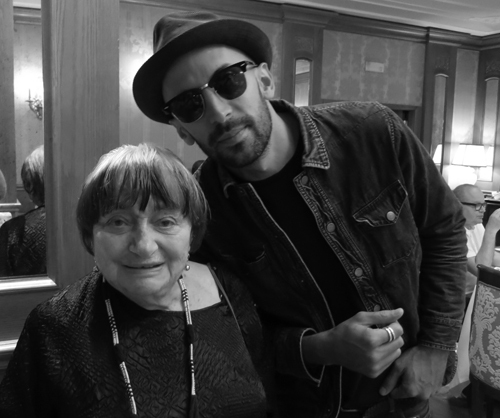 Broiling heat—one day approached 100 degrees Fahrenheit—didn’t seem to keep many away from the films, panels, book talks, and other events that crowded the schedule. Between 9 AM and 1 PM, each two-hour block offered six to eight choices, and the afternoon blocks, running from 2:30 to about 8 PM offered even more. Now that the festival has another space, a nearby university auditorium fitted for DCP projection, a whole new column of events was slotted in. Below, a bit of the queue for the Isabella Rossellini interview in the auditorium. 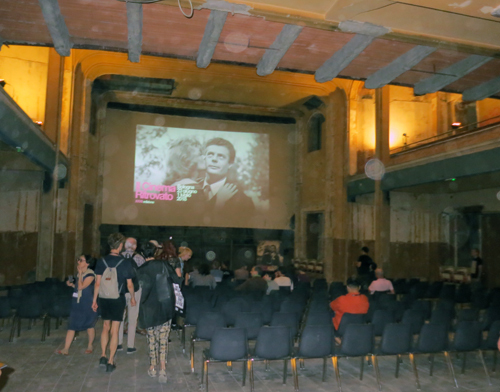 Next year, planners are hoping to add screenings at a renovated 100-year-old theatre on the Maggiore. There seems no doubt that the Cannes of Classic Cinema will get even bigger. For the first time, I felt the pace was a bit rushed. Getting together with old friends was somewhat harder than before, unless you came a day or so early. (Even then, there were tempting Maggiore evening shows.) But the atmosphere was still easygoing. 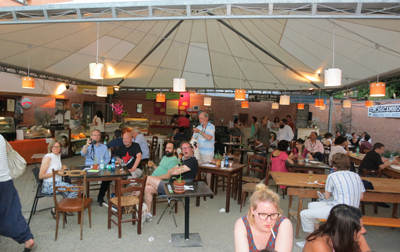 The courtyard of the Cineteca was an island of steamy relaxation, boasting more tables than in past years. The tent cafe provided snacks and drinks for those who simply decided not to be obsessive. Even I stopped and sat down, twice. Word is out. A new wave of young film lovers has discovered Ritrovato. What had been dominated by hip (or hip-replaced) baby boomers was now teeming with students. The festival has added a Kids section and another devoted to older teens, and it was a pleasure to see them winding through the corridors of the Cineteca. The World Press has finally woken up too. The Guardian ran a rapturous encomium. Loyal blog sites such as Photogénie provided extensive coverage. Just speaking for us, this was the first year Kristin and I had almost no time to blog during the event. Hence this, the last of our catch-up entries. (Click back for the earlier ones.) And I will leave out a lot. 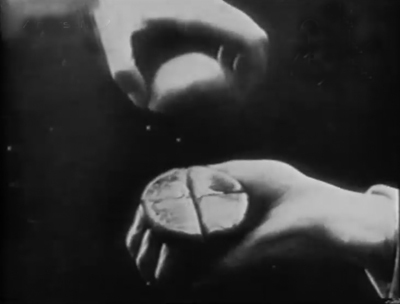 Has everything been said about digital cinema and its differences from photochemical cinema? Maybe so. Nonetheless, the two panels I visited on the subject raised a lot of intriguing points, in quite different formats. The first session compared 35mm prints with digital restorations. Through clever maneuvering, the Ritrovato boffins were able to switch back and forth between versions as both were running, and the results were pretty compelling. Schawn Belston of Twentieth Century Fox provided a sample of Warlock, a twenty-year old print. It was contrasty but had saturated color; this was the sort of image I remember seeing in theatres. The digital restoration, a work in progress, was paler, with sharper edges, more solid-black shadows, and a more pastel color design. Pretty Poison was a much newer print, on Vision stock, and looked fine, as did the DCP. Grover Crisp of Sony brought a Kubrick-approved print of Dr. Strangelove, considered best-quality in 1990s. He ran it in tandem with the recent 4K restoration managed by Cineric. The difference was very striking. 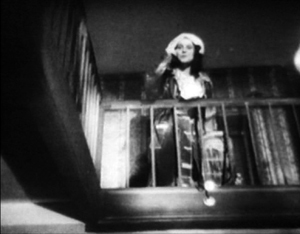 For black-and-white, at least, the DCP seemed to me to have all the better of it. Kubrick, a major otaku on matters photographic, would I think have approved. 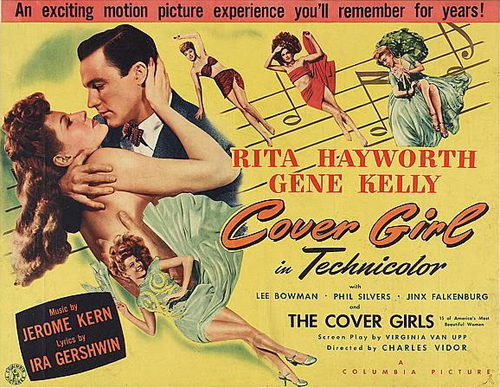 Further proof of the Crisp-Sony finesse was available in the utterly dazzling DCP we saw of Cover Girl (1944) on the big Arlecchino screen. I was surprised to find some of my circle disdaining this movie, but I think it’s wonderful. It seems to me a rough draft for many of Gene Kelly’s MGM pictures, from the trio boy-girl-stooge we get in Singin’ in the Rain (with Phil Silvers as Donald O’Connor) to the mind-bending doppelganger dance that looks forward to Anchors Aweigh and Jerry the Mouse. I also like the clever motifs of feet and faces, and the flashbacks, and …well, I must stop, because I expect to use Cover Girl as a major example in my still-unfinished book on Hollywood in the 1940s. Suffice it to say that I have never seen a better DCP rendering of Technicolor than was on display in Grover’s new edition. Davide Pozzi rounded out the session with a pairwise comparison of different versions of Rocco and His Brothers. A vintage print from the camera negative had been vinegared, so the shots had rippling focus; the DCP restoration was fairly sharp and bright. This was a real work of reclamation. The panelists agreed on a lot. Don’t try to banish grain; film is grainy. Don’t expect to match everything. No two prints ever looked alike anyhow, and variations among screens, lamps, and other exhibition factors don’t let us capture a pristine original experience. Because of the advances of digital restoration, there are new frustrations. Archivists are aware that older restorations may not look good today, while cinephiles who forgive scratches on “vintage” 35mm copies howl if a restoration doesn’t look smooth as silk. Film has many futures. Pick one. Another panel, “The Future of Film” (let’s ban this as a title, shall we? ), was less focused but more provocative. No fewer than fifteen critics, archivists, manufacturers, and filmmakers gathered before a standing-room crowd to discuss the prospects for the photochemical medium formerly known as film. On the manufacturing front, Kodak and Orwo are committed to producing motion-picture stock. Christian Richter of Kodak noted that in 2006 his firm produced 11.8 billion feet of motion-picture film, while last year it produced only 450 million feet. The demand may be plateauing, but it’s too soon to be sure. The crucial problem may be the absence of labs, although boutique labs are starting to appear. Some filmmakers, such as Gabe Klinger, consider film an essential part of their aesthetic. Alexander Payne prefers to shoot on film, but more important is film projection. He restated his view that “flicker will always be superior to glow.” By contrast, archivist Grover Crisp proposed that the standard of film projection had sunk so low that he prefers to see digital presentations, although those too can be substandard. Some archives are preserving on film recent movies, including those shot digitally. Sony does, as does the CNC. 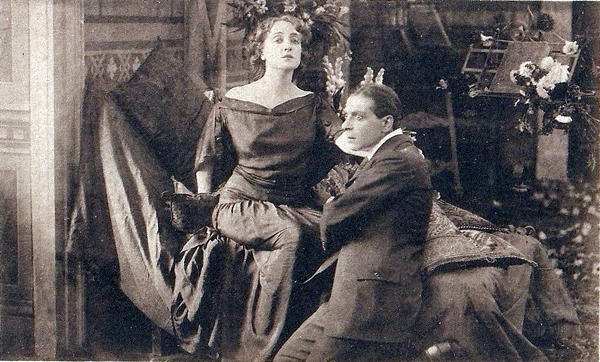 Eric Le Roy reported that all French films receiving subsidy must deposit a print and the negative there, even if the project originated digitally. Mike Pogorzelski of the Academy archive spoke of the ongoing “Film to Film” effort, begun in 2012. More generally, two archivists argued that the future of film lay in museums. 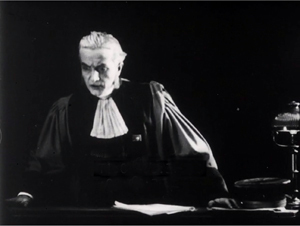 José Manuel Costa of the Portuguese film archive argued that the basic principle had to be a respect for the nature of the medium. Cinema has changed, but it has existed in a specific technological environment since the nineteenth century, and it’s the mission of a film museum to retain that technology as long as possible. 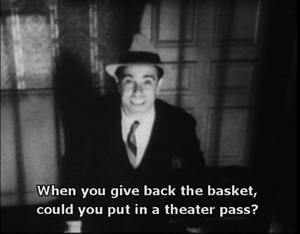 Accordingly, a film should be shown in the format in which it was made. 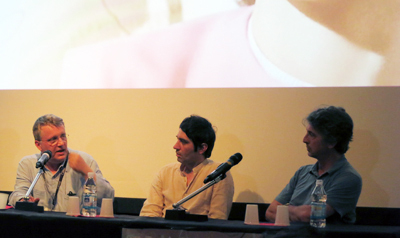 Belgian film archivist Nicola Mazzanti (on left above, with Pietro Marcello and Alexander Payne) seemed in accord. 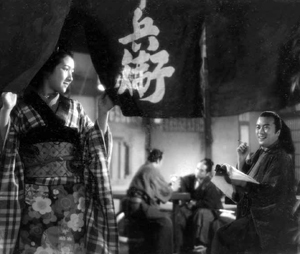 He remarked, in the wake of the earlier session, that digital treatment, or film restoration generally, can’t duplicate tinting, toning, stencil color, Technicolor, and other older processes. The originals are what they are—imperfect—but that imperfection is inherent in their material history. More acutely, the world outside the archive is entirely digital, so it will be a big task to keep analog alive. It will take money. And no European archive’s budget equals the cost of a single season of La Scala. Scott Foundas, who chaired the sessions with easy good humor, indicated that perhaps the state of play was this. Digital capture and storage would not wholly replace film. By now film is recognized as distinct and worth its own attention. It’s going to exist alongside digital media for some time to come, although in niches and in more rarefied forms than before; like vinyl records. 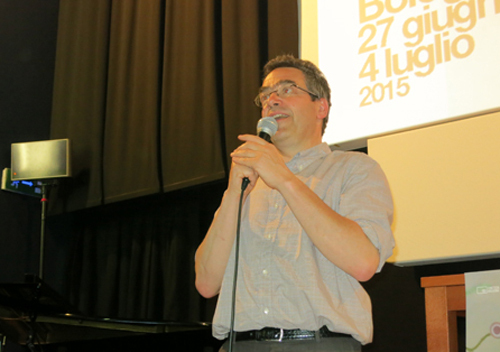 Bologna, it became clear, is one of those places where film will continue to flourish. Fifty percent of screenings this year were analog, and the programmers included showings of Vertigo, The Heroes of Telemark, All That Heaven Allows, and other titles on “vintage” prints from earlier eras. Audiences packed in to see them and cheered. 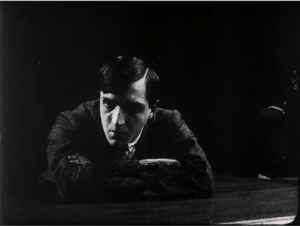 With all the talk of film’s enduring powers, two screenings reminded me of the power of photochemical recording as a record of history, both en masse and individual. 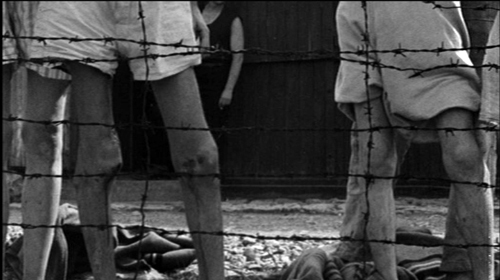 German Concentration Camps Factual Survey was overseen by Sidney Bernstein and involved several skilled filmmakers, including Hitchcock. It was designed to be shown to the German people as a record of what they had ignored over the last dozen years. But it remained unfinished when it was shelved in 1945. 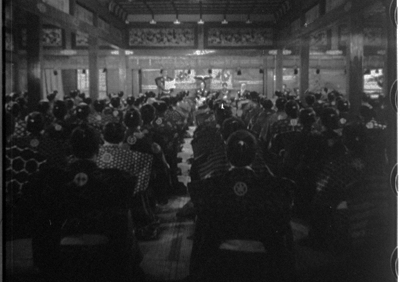 In recent years the surviving reels have been shown occasionally under the title Memory of the Camps. In 2008 several staff at London’s Imperial War Museum began to restore the original and fill out the final reel. 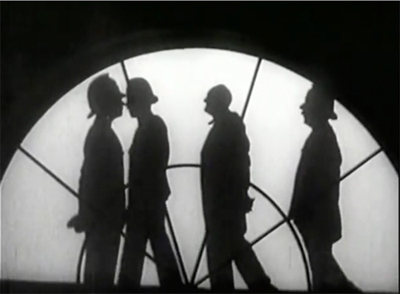 The filmmakers added a new recording of the original commentary, previously not attached to the footage. Friends of Andy Warhol often commented that he used his ever-present Polaroid to keep his distance from his surroundings. You wonder if a similar strategy didn’t insulate, to some minimal degree, the American, British, and Russian cameramen who filmed the liberation of the camps. Their images show shriveled corpses covering the ground, flung into pits, shoveled into heaps. Spindly survivors move like ghostly marionettes. When I saw the first images of the bland camp officials smoking and chatting under guard, I immediately wondered: What self-control it must have taken not to have killed these men on sight. 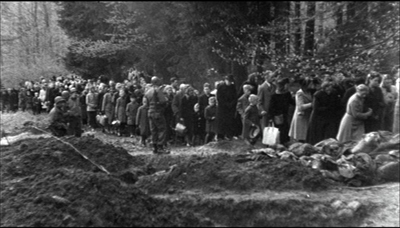 The film is structured as a sort of anti-Grand Tour, starting in Bergen-Belsen, where SS officers seem genuinely annoyed at being forced to clear out the dead. The film moves eastward, guiding us by maps, to end in the abandoned Nazi extermination camps built in German-occupied Poland. Here shoe brushes, spectacles, and children’s toys fill warehouses. The names of German companies proudly adorn ovens. 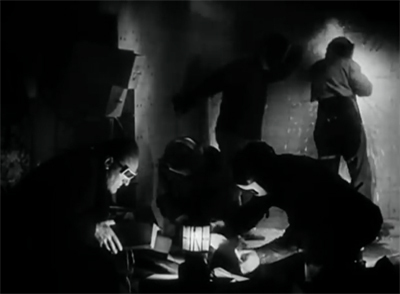 One of the film’s main points, apparently suggested by Hitchcock, is the fact that the camps existed very close to population centers. Did the people celebrating Oktoberfest in Munich ever think of Dachau, half an hour away by train? Did the people breathing the mountain air of Ebensee spare a thought for the camp nearby? Arriving Allies insisted that people from surrounding towns be brought to witness what they had ignored. In the footage, men, women, and children file by the carnage. Some seem moved, but eerie shots show town elders standing stiff and impassive before heaps of bodies. Godard has suggested that there must be footage of the day-to-day running of the camps. Would the society that devised Agfa film and Arriflex cameras have failed to document the industrial-scale slaughter of which the Reich was so proud? Were there no amateur cineastes among the SS-men leading comfortable lives in their cottages? Was there no Leni Riefenstahl to cheerfully lend credibility to these charnel houses? Even if such footage exists, German Concentration Camps Factual Survey will serve as an unforgettable reminder that humans have a terrifying gift for brutality, and for ignoring horrors enacted right beside them. Visita ou Memórias e Confissões. 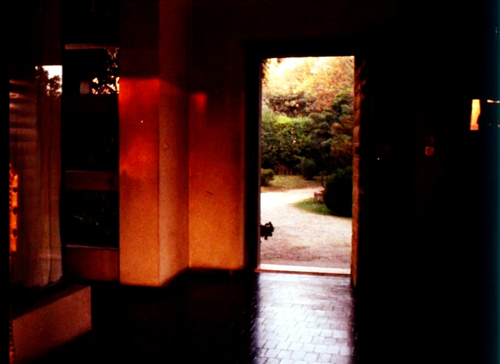 In 1982, financial setbacks forced the Portuguese director Manoel de Oliveira to sell the house he had lived in for forty years. Before leaving, he decided to record his affection for the place. The result, Visita ou Memórias e Confissões was the quietest film I saw at Ritrovato. It was also one of the best. We start at the gateway, coming in as if guests. But who owns the voices we hear? The murmuring man and woman who seem to be our surrogates passing along the path? We never see them as they enter the magnificently curvilinear house. But is it right to say they? Although we hear two voices, we hear only one person’s footsteps. 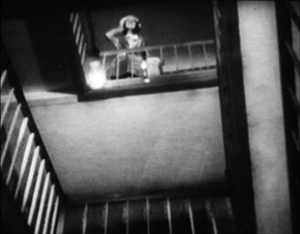 The somewhat whimsical uncertainty that haunts so many Oliveira films is summoned up here by the simplest of means. Eventually Oliveira greets us, standing in his study before his typewriter, and he explains some of the house’s history. He also runs some footage on a 16mm projector that coaxes him into discussing death, women, virginity, and sanctity. “I’m a man of many doubts and much faith.” Occasionally we hear the couple whispering as we coast past art objects and family pictures. Oliveira tells us of his 1963 arrest while making Rite of Spring and his 1974 conflict with workers in his family’s factory—a tumultuous event that, we learn rather late, is the cause of his financial distress. 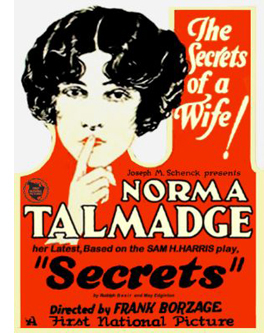 These revelations come in the midst of a fascinating account of his family, accompanied by a tribute to his wife, to whom the film is dedicated. 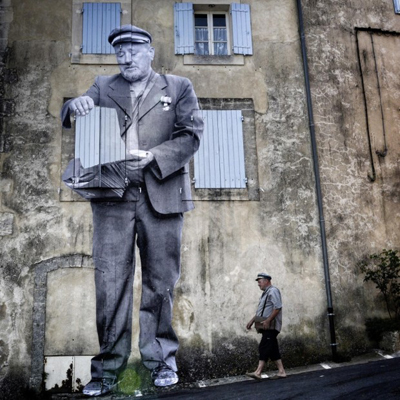 Individual history and social history blend in his recollections and the flow of visual memorabilia. 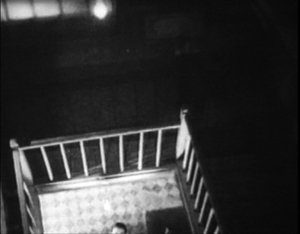 The spectral visitors glide out with us, and the film that Oliveira has been showing halts, leaving us a blaring white frame. According to his wishes, Visita wasn’t shown until after his death. Perhaps in 1982 he expected that event to come rather soon; he was seventy-three, after all. He couldn’t have known, surely, that he would live another thirty-three years and make twenty-four more films. As José Manuel Costa pointed out, the great director wanted the film to be shown posthumously not as a final boast, but rather a wry, modest memoir of an exceptionally full life. By turns ironic and confessional, Oliveira’s testament demonstrates that we can be moved by a soft-spoken, patient peeling back of layers of the past. Of course it was shown on film. Kristin and I thank the many staff members who make Ritrovato such a wonderful experience. Special thanks to Gian Luca Farinelli, Guy Borlée, and Cecilia Cenciarelli. We are particularly grateful to Marcella Natale for her many moments of assistance, including giving us preliminary attendance figures. German Concentration Camps Factual Survey will play several film festivals and public venues during the rest of the year and will eventually be distributed on DVD. 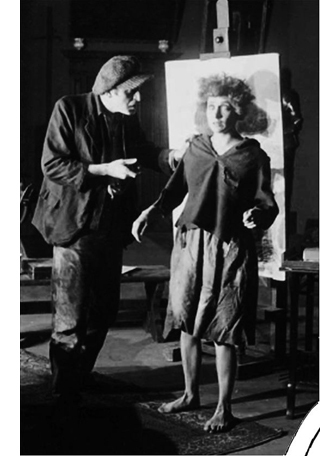 Night Will Fall (2014), André Singer’s documentary on the making and restoration of the original film, is already available. P.S. 31 July: Danny Kasman has an illuminating interview with Toby Haggith on the Factual Survey, along with important background information, at Cineaste.